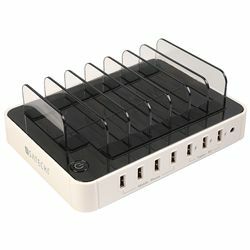 The Satechi 7-port USB charger allows you to charge up to seven devices simultaneously via USB ports. With four ports providing 5 volts/1 amp and 3 more ports providing 5 volts/2.4 amps of power, you can charge phones, tablets, music players, cameras and more. Charge your devices and store them on the charging station without having to remove protective cases. Always keep your devices charged and organized so theyre ready when you need them.